every cell in your body revitalized. Do you struggle to find sacred time and space to devote to your writing and ideas? Do you have a message that you’d like to share with the world but need help to bring out your inner writer and polish your prose to convey your message more eloquently? Our goal through Wellness & Writing Retreats is to provide the fertile ground you will need to nurture your voice and find clarity and purpose in your writing. ONLY 12 PARTICIPANTS WILL BE JOINING US IN ITALY. WILL YOU BE ONE OF THEM? THERE ARE 0 SPACES LEFT! 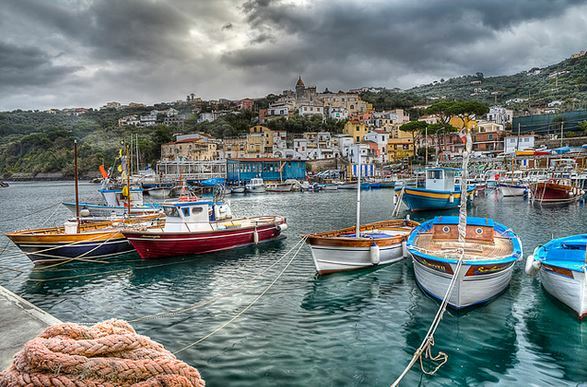 INSPIRE you by exploring the treasures of Sorrento Peninsula with a group of like-minded seekers. REJUVENATE your soul while you sit in the shade of an olive tree in awe of the vast blue sea before you. CREATE a new piece of work, or finish that project that you’ve been nurturing for years. Watch your writing come alive as we spark your creative flame. A FEW TESTIMONIALS FROM OUR LAST RETREAT. Attend! You won’t regret it. Through skillfully guided feedback, my writing path emerged, intentions crystalized and a commitment to daily writing became a reality beyond question. 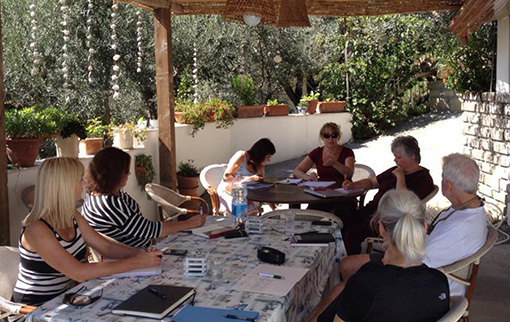 Bonding with new comrades in-writing… chilin-an-dippin in a silky Mediterranean. Wow!! I will forever hold close to my heart this Italian adventure. The lessons I have learned will follow me throughout my career… and the friends I have made will be cherished always. Arrivederci – until we see each other again. 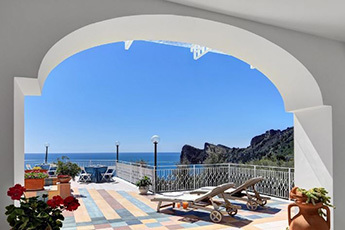 Reconnect with your muse in our Private Villa on the spectacular Amalfi coast in Nerano, Italy! Our Private Villa will captivate you from the moment you step onto the property. 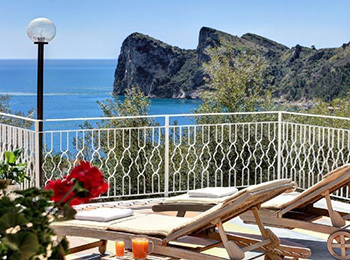 Set in the quiet bay of Nerano (Massa Lubrense), a charming seaside resort, famous for an atmosphere of great tranquility and the clear waters of the Amalfitan and Sorrentina Coast. 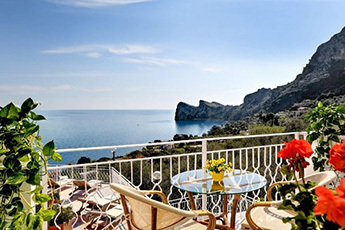 This location is ideal for writers who want to reawaken their passion and find inspiration for the creation of new work; a historical destination for famous authors like Wagner, Ibsen, Nietzsche, Browning and Caruso. Nerano is near the touristic and elegant city of Sorrento, but far enough to be away from the hustle and bustle of the tourists. This hotel within a villa offers all the amenities and personal attention of a first class hotel, but with the exclusivity, serenity, and comfort of a private villa, reserved exclusively for our W&W group. 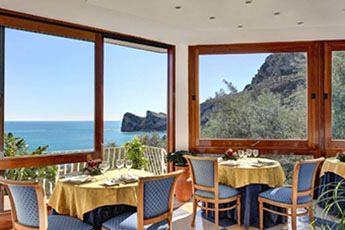 Atop the highest of three terraces, you will immediately be awed by the vastness of the sea in front of you. Here, you can relax in the hammocks or sit in the shade of the olive trees on the grass lawn. On the main terrace, there are deck chairs where you can catch some sun, read your favorite book (or write one), take a swim in the new infinity pool or take a midday nap. Just steps from your room, you can enjoy your morning cappuccino or an evening cocktail. The view of the coves of Nerano beach and the blueness of the Tyrrhenian Sea will make it very easy for you to tap into your creativity and spark life into whatever writing project you have on the go! Eventually, you will want to enjoy the quiet, exclusive beaches of Nerano which are just 500 meters away, accessed by a pathway from the villa. 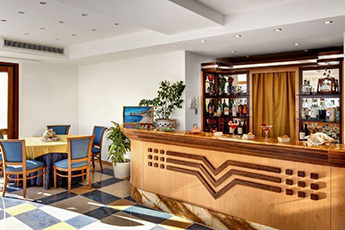 On the ground level, there is a full bar and lounge with satellite TV and comfortable sofas. All of the cozy rooms offer a flat screen TV, wardrobe, desk, lamps, telephone, and large private bathroom, complete with walk-in shower, toilet, bidet, and hair dryer. Free WiFi, satellite TV, air conditioner, heater, and a mini fridge stocked with water, beer, Coke, and lemon soda are some of the other amenities in each and every room. Details for the 2019 Retreat are under construction… Stay tuned. We meet at our rendezvous hotel in Naples on Friday. Saturday we head out together to our Villa in Nerano. The duration of our week will be filled with writing, resting, sharing, exploring and eating wonderful Italian cuisine. Trip to the famed site of Pompeii at the foot of Mount Vesuvius. To local farms to sample Italy’s finest produce. A boat trip to breathtaking Positano. (Date) is check out day – transfer to the airport is available. There are up to 12 spaces open for this Unique Retreat Opportunity! Got a Question? Need to Contact Me Personally? PLEASE DO! Deluxe = Sea View & Terrace. 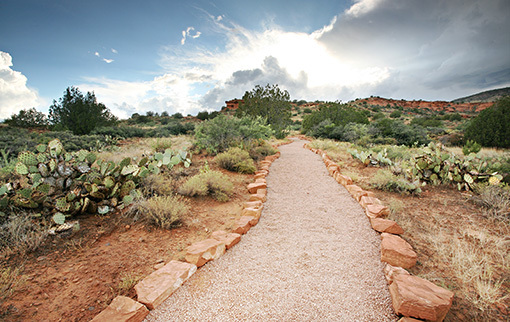 Your spot at this Retreat can be put on hold by filling out a Retreat Registration Form. To guarantee your magical time in Italy with us, 40% of the Retreat price is required as a deposit. The remaining 60% is due 60 days prior to the Retreat arrival date. Due to the nature of these exclusive Retreat house locations, and small group sizes, reimbursement of deposits cannot be made. Please be sure to acquire cancellation travel insurance to help protect you in the event you have an unexpected emergency and cannot join us. In the unlikely event that we cancel a retreat, all retreat payments will be refunded in full. 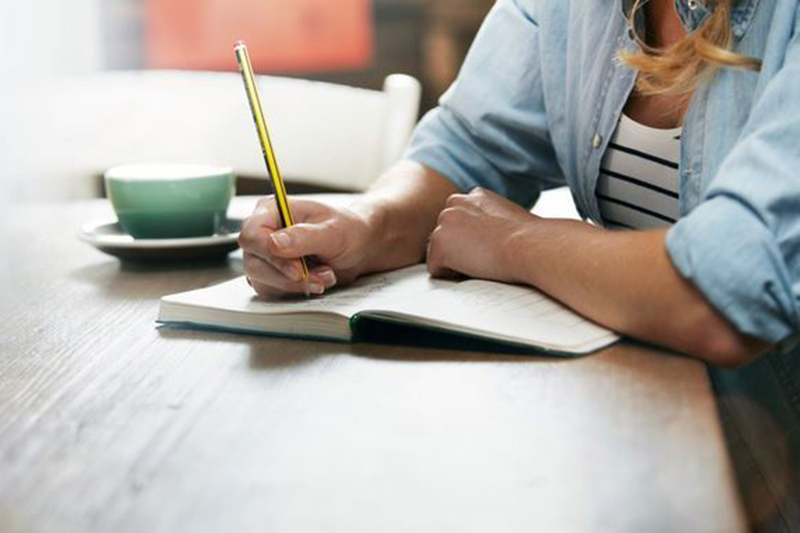 Wellness & Writing Retreats is not responsible for any expenses or damages incurred as a result of event/program cancellation including preparation costs, airline tickets, travel documents or other expenses. Again, travel insurance is always recommended. 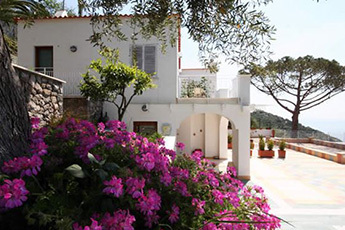 accommodation) & 6 nights in our Retreat Villa in Nerano. Breakfasts, 5 lunches & 6 dinners. Informative and uplifting Wellness & Writing workshops with Lisa Fugard, Julie Colvin & Gary Finnan. Follow-up Conference Call with Lisa Fugard, Julie Colvin & Gary Finnan. cheese, wine, Limoncello & pizza! Boat excursion to explore breathtaking Positano. Room mini-bar selections are not included. 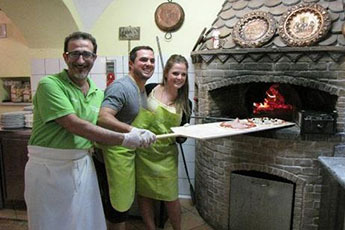 There will be an optional group dinner this evening in the historic city center of Naples. Today we head off by private transport with our local guide to visit the famed site of Pompeii at the foot of Mount Vesuvius, one of Italy’s best-known sites. After our guided tour, we will head to Sorrento for lunch. Then it’s off to our accommodation in the beautiful and tranquil town of Nerano. Free evening to settle in and get a good night sleep. 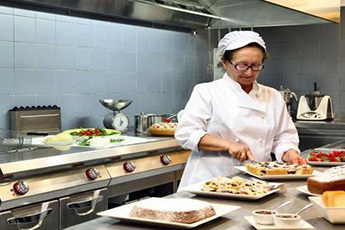 Gastronomical Tour Day at local farms: We will spend today in nature, get to know the culture and taste the local products of Schiazzano, which boasts a spectacular view over the Gulf of Napoli. First we get a guided tour of the lemon tree grounds. There, we will see the authentic lemon, Ovale di Sorrento, used to make the famous liqueur, Limoncello. We will taste lemon products such as lemon juice, slice of lemon with sugar, and olive products such as olive oil, oil with taste of lemon and orange, each on a slice of homemade bread. After our visit to the lemon farm, we then tour a cattle farm that shows the production of caciottina cheese, fresh mozzarella and provolone del Monaco cheese. We get to taste their cheese, salami and local wine. Then it’s time for lunch. We will participate in making real Neapolitan pizza for lunch, including dessert and espresso coffee. 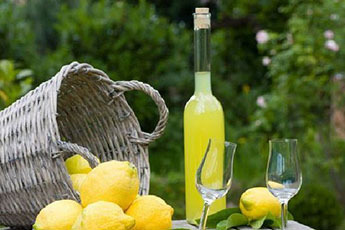 Finally we return to the lemon farm to taste freshly made Limoncello before returning to our Retreat Villa. To be determined depending on the energy of the group after our day on the land. Boat excursion to explore beautiful Positano, the magical seaside town that has charmed visitors for centuries with its unique coastline dotted with hidden caves, secluded beaches. 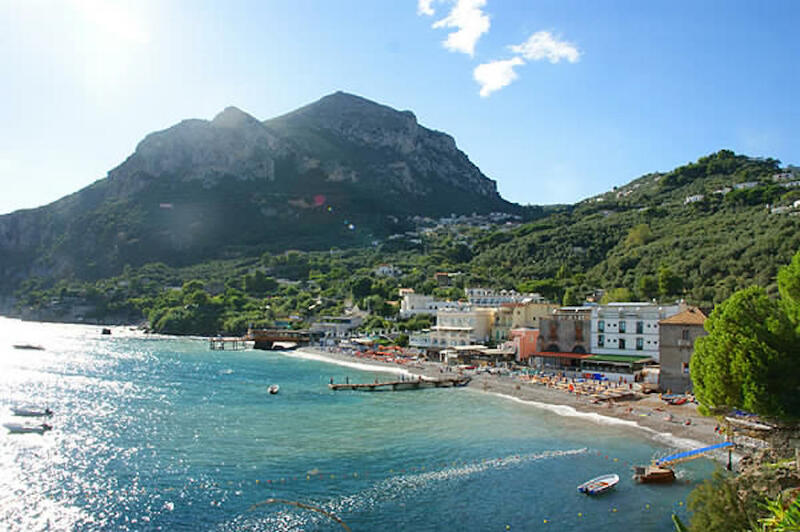 We’ll get picked up by boat right in Nerano’s “Marina del Cantonein” and cruise around the coastline with time to swim in the nicest corners of the Sorrento Coast. Transport to Naples Airport provided. It is recommended that you plan a flight home AFTER 4:00 PM on Friday, Sept. 25th, to give you enough time to arrive to the airport. The writing workshops will be more closely structured and created once we have evaluated the needs of the writers in our group. Scheduling changes in this itinerary might occur depending on weather or other unforeseen issues. This menu has no peanuts, no soy, no legumes. We also provide vegan and gluten free options. 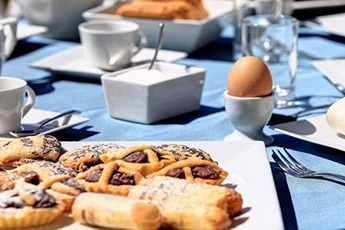 Additional drinks (other than coffee, tea, water & a Limoncello with your evening dessert) are not included in the cost of this Retreat and can be purchased separately at your own expense. 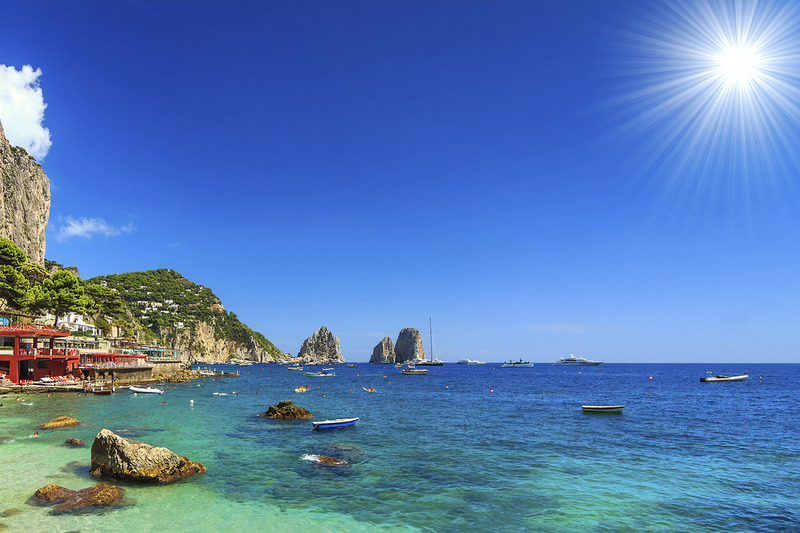 The nearest International airport to our destination is Naples Airport, also known as Capodichino Airport (IATA: NAP). It’s well organized and connected to the center of the city by public transportation. The plan is to each make our way to the historic city centre of Naples for Friday…, 2018. We will meet by 6:00 PM at our rendezvous point, the Hotel Correra. Rooms will be shared accommodation on our first night in Naples. 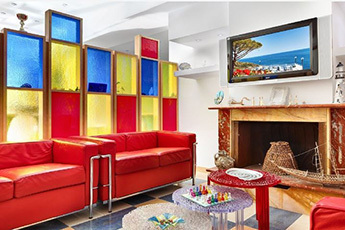 If you require a private room, you will need to arrange that separately at your own expense. If you’re flying in, we will help to arrange a private transfer for you to the Hotel Correra. If you are coming by train or other means, please contact the Hotel Correra 241 website for directions to the hotel. Travel insurance is compulsory in order to participate on this trip. Please provide evidence of your travel insurance prior to departure. When selecting a travel insurance policy please bear in mind that all clients must have medical coverage and that we require a minimum coverage of USD 200,000 for repatriation and emergency rescue. We strongly recommend that the policy also covers personal liability, cancellation, curtailment and loss of luggage and personal effects. If you have credit card insurance we require proof of purchase of the trip (a receipt of credit card statement) with a credit card in your name. Contact your bank for details of their participating insurer, the level of coverage and emergency contact telephone number. What does the price of the Retreat Include? Accommodation for 7 nights. Our first night in at the Hotel Correra in Naples (shared accommodation) & 6 nights in our Retreat Villa in Nerano. Transfer from Hotel Correra to Villa in Nerano on Saturday… 2018. Transfer from Nerano to Airport in Naples, morning of Friday… 2018. 7 breakfasts, 5 lunches, & 6 dinners. Informative and uplifting Wellness & Writing workshops and evening group sessions with Lisa Fugard, Julie Colvin & Gary Finnan. Follow-up conference call with Lisa Fugard and Julie Colvin after Retreat. 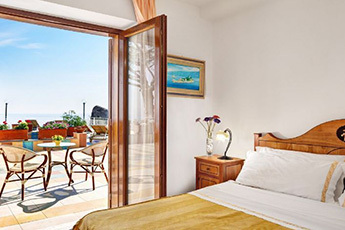 Visit to the ruins of Pompeii (an ancient Roman town that was destroyed by the eruption of Mount Vesuvius in 79 AD) as well as a visit to the majestic seaside city of Sorrento. Visit to local farms for the day to explore and taste Italy’s finest lemons, olives, cheese, wine, Limoncello & pizza! Travelers must exercise common sense and caution at all times. There are often “Gypsies” in areas like airports and train stations. Here are some tips I have found to keep you aware of your surroundings and your money! It is customary in Europe to leave a small tip for service providers, such as; waiters and drivers. 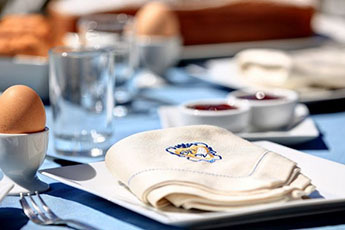 If you are pleased with the service, the normal tip is 1- 2 Euros. Italy requires no vaccinations for entry according to IAMAT. Likewise, no vaccinations are needed for re-entry from Italy into the U.S. or Canada. It is still encouraged that all participants seek their physician’s advice regarding necessary or advisable vaccinations, medical precautions, or other medical concerns regarding your trip to Europe. This Retreat is Non-Smoking and peanut free. No exceptions. It is vital that you check for yourself and understand that you are fully responsible for your own visa requirements. All visitors to the EU (European Union) and EEC (European Economic Community) countries require a valid passport (with a minimum of 6 months validity). The information in this trip details document has been compiled with care and is provided in good faith. However it is subject to change should circumstances be altered beyond our control or to make improvements to our existing plans. We will do our best to inform of any changes should they need to be made for any reason. While it is our intention to adhere to the route described and menu in our itinerary, there is a certain amount of flexibility built into it, and on occasion it may be necessary, or desirable to make alterations. Additionally, any travel times listed are approximations only and subject to vary due to local circumstances. For details of payment, please refer to the Pricing PDF. Many national governments provide a regularly updated advice service on safety issues involved with international travel. It is recommended that you check your government’s advice for their latest travel information before departure. It is often strongly recommend using a neck wallet or money belt while travelling, for the safe keeping of your passport, air tickets, travelers’ checks, cash and other valuable items. Leave your valuable jewelry at home – you won’t need it while travelling. A lock is recommended for securing your luggage. During your trip you will have some free time to pursue your own interests, relax and take it easy or explore at your leisure. Please use your own good judgment when selecting an activity in your free time. Although the cities visited on our tour are generally safe during the day, there can be risks to wandering throughout any major city at night. It is also recommended to stay in small groups and to take taxis to and from restaurants, or during night time excursions. Like anywhere in the world, major cities have areas safer than others, use common sense, be aware of your surroundings and mind your personal belongings. Travelers must exercise common sense and caution at all times. Tourists should stick to set travel arrangements and avoid unknown areas. Always keep a photocopy of your passport, airline tickets and a record of your travelers’ checks and credit card numbers separate from where you keep the originals and ideally with your emergency contact person back at home. Wellness & Writing Retreats shall not be liable in any way to the Client for death, bodily injury, illness, damage, delay or other loss or detriment to person or property, or financial costs both direct and indirect incurred, or for Wellness & Writing Retreats failure to commence, perform and/ or complete any duty owed to the Client if such death, delay, bodily injury (including emotional distress or injury), illness, damage or other loss or detriment to person or property is caused by Act of God, war or war like operations, mechanical breakdowns, terrorist activities or threat thereof, civil commotions, labor difficulties, interference by authorities, political disturbance, howsoever and where so ever any of the same may arise or be caused, riot, insurrection and government restraint, fire, extreme weather or any other cause whatsoever beyond the reasonable control of Wellness & Writing Retreats; or an event which Wellness & Writing Retreats or the supplier of services, even with all due care, could not foresee. Advance planning will best help you keep your electronic devices charged and ready to use. There are several things you will need to consider as you prepare for your trip. Some travelers assume they need expensive voltage converters to charge their electronic devices. In reality, most laptop computers, cell phones and camera battery chargers are dual voltage, meaning they will work on 110 volts (in the United States, for example) and on 220 volts (in Europe and most other parts of the world) and will work with electric frequencies ranging from 50 Hertz to 60 Hertz. In fact, many electronic devices will be damaged or destroyed by voltage converters, since the device already contains a converter. To find out whether your electronic device is dual voltage, you will need to read the tiny words written on the bottom of your device or charger. (You may need a magnifying glass to read the miniscule print.) If your device is dual voltage, you will see something like “Input 100 – 240V, 50 – 60 Hz.” If your device is indeed dual voltage, you will need a plug adapter to use it, but not a voltage converter. Take a few moments to review the capabilities of your mobile devices and the costs to use them in another country. Plan to bring only those devices you will use regularly; this will minimize your charging time and keep data roaming charges down. (If you don’t know how much overseas cell phone or tablet use will cost, contact your service provider and ask before you travel.) If one device, such as a tablet, can do everything that your laptop and cell phone can, leave something at home. Each country determines its own electrical distribution system and type of electrical outlet. In the United States, for example, two-pronged plugs are the standard, although three-pronged grounded plugs are also very common. In Italy, most outlets take plugs with two round prongs, although bathrooms, if they have any outlets, often have three-pronged (round prongs, all in a row) grounded outlets. You can buy a multi-country plug adapter if you are not sure which type of adapter to bring, or you can research the types of plug adapters commonly needed for your destination country and bring those. Ideally, you should bring several adapters if you plan to charge more than one electronic device per day. Your hotel room may only have a few electrical outlets, but some may be in better condition than others, and some may be grounded outlets rather than standard ones. You may even need to plug one adapter into another in order to use it. For example, you can plug a smaller-sized two-pronged European adapter into the smaller-sized grounded three-prong European adapter in order to plug your electronic device’s larger two-pronged European plug into a grounded outlet. Obviously, you can’t plug your adapters into an outlet that is hundreds of miles away, but you can determine which plugs fit into your collection of adapters. Be sure the plug fits smoothly and snugly into the adapter; a floppy fit will create problems when you try to charge your electronic devices. Julie’s first book, A Cure for Emma, became a bestseller within days of its release sharing inspiration and hope for anyone going through adversity. 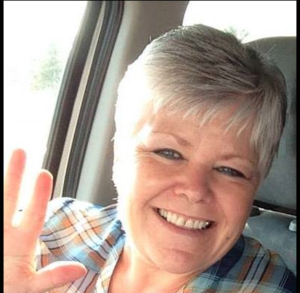 Many who had shared Julie’s journey to publication via her uplifting blogs and Facebook pages began to request her help to bring their stories to life. They were moved by Julie’s tenacity to do anything that she set her mind to doing, and her dedication to doing it exceptionally well. 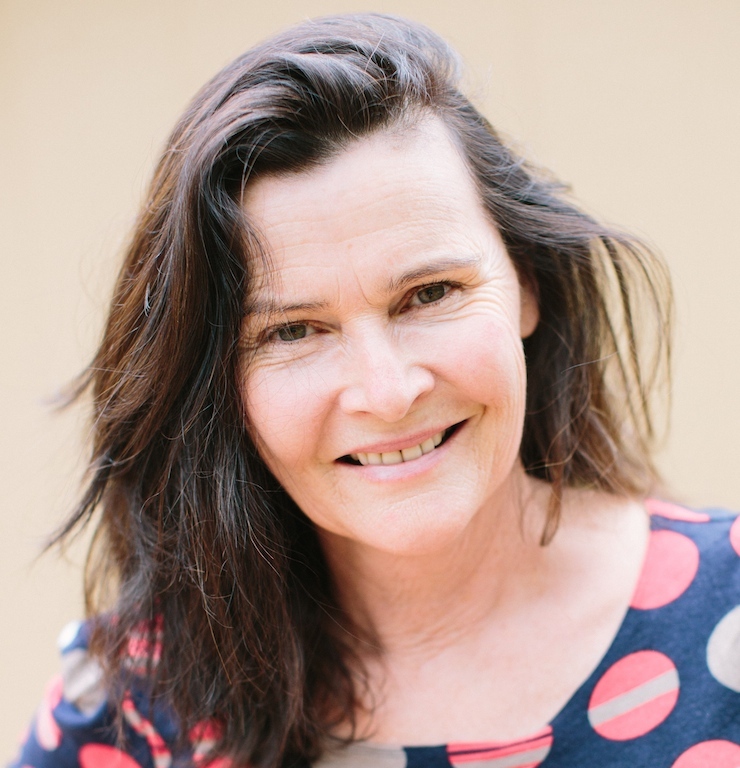 Lisa is an award-winning novelist and has been leading writing workshops for the past 16 years. From 2009 to 2012 she was a presenter in the hugely successful Hay House Writer’s Workshop. 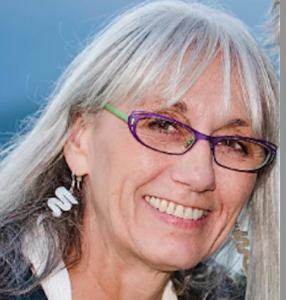 In 2014, she had the pleasure of coaching writers in Mastin Kipp’s Bali Writer’s Mastermind. She has taught at Georgian Court University in N.J. and is passionate about the writer’s craft. 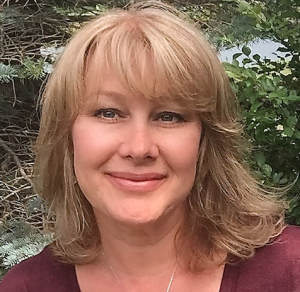 Lisa has helped many of her students and clients bring their manuscripts to publication. Her Hay House ebook, 21 Days to Awaken the Writer Within, is a call to trust your process as a writer and to express your unique writer’s voice. 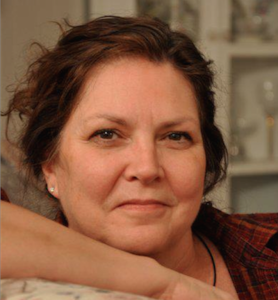 Lisa’s novel Skinner’s Drift, published by Scribner, was a 2006 New York Times Notable Book and runner up of the 2007 Dayton Literary Peace Prize. She has published short stories in literary journals and anthologies. Her travel articles and book reviews have been published in the NY Times and LA Times. Join Lisa Fugard and myself for this life changing week. It’s the biggest step you can take toward the life you were meant to live. Nowhere will you find an opportunity like this — abundant attention and personal guidance from industry experts, in our own private luxury villa. 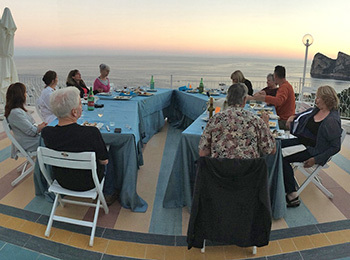 You will leave this transformational retreat armed with tools to reconnect with your life and your writing. Opt-in for Your Chance to Win!